The online storage market is evolving fast. In the past, users could expect no more than a simple service where files could be slowly uploaded and downloaded from a mapped virtual drive or a simple web based interface. Little competition (and the bursting of the bubble) led to very high prices for a minimal amount of storage. Over the last year a slew of new services have launched (some are launching in February) with serious web 2.0 features, reasonable pricing (including free unlimited storage) and, in at least one case (OmniDrive), the ability to read/write directly to the file with local applications like Office, on the remote server. This last feature speeds the process of writing to files significantly by skipping the requirement to download the file to the hard drive first. We looked at a total of thirteen companies. They are: AllMyData, Box.net, eSnips, Freepository, (the unfortunately named) GoDaddy, iStorage, Mofile, Mozy, Omnidrive, Openomy, Streamload, Strongspace and Xdrive. Another service, Zingee, has yet to launch and may also (or may not) have a compelling offering. Of the thirteen companies that we researched for this post, three really stand out. Australia-based OmniDrive (unfunded but not for long) is the clear leader in features. Box.net and Streamload are also very good choices. The services can roughly be broken down into storage-centric and sharing-centric. Some services, like Mozy and the unfortunately named Godaddy, are centered on storage only. GoDaddy offers online file backup with very basic uploading and downloading features – effectively a remote network drive. They are a bare-bones service with a fairly attractive price point ($20/year for 2 GB). You will not find sharing or other advanced features here. Other services offer storage but really focus on sharing files. There are a number of options here, but the best (OmniDrive, Box.net and Streamload) offer full private and public sharing. In addition, I really like the way Box.net approaches group folders, where any number of people can have read/write priviliges. Omnidrive is close to launching this feature as well. Most of the new players (possibly with the exception of Mozy) are laser focused on key web 2.0 features. The best have multiple folders (private, shared, group, public), RSS feeds for each folder, etc. A couple, including Omnidrive, have also built features that allow subscriptions for RSS enclosures (such as podcasts), so that those files are stored in the cloud instead of your hard drive. And OmniDrive has one key feature that no one else matches: full read/write functionality on the file, in the cloud. Open a file from your Omnidrive, edit it and write it back to Omnidrive without ever downloading a local copy. Once they release their API, I imagine many, many services will mash the Omnidrive storage service into their applications. It is just too compelling not to. AllMyData, unique among the group, is a full peer-to-peer solution with “grid storage”. This means you give up storage on your hard drive for other users, and you get theirs in return. Putting aside the fact that giving up storage is exactly what users don’t want when looking for a solution, the fact that others’ computers must be powerd up and online for you to be able to access your files is a serious service limitation. Pricing is all over the place, although I expect it to settle down as competition drives some of these companies out of the market. Streamload is the most aggresive on pricing – offering a full 25 GB free to every user. The obvious way to market these products, in my opinion, is to boldly offer unlimited storage for a nominal sum. Costs can be covered via a one-time sign up fee and through charges on download bandwidth (once I need the files, I’m willing to pay to get them). I firmly believe that online storage should, and will, be packaged with new computers and applications like Windows. The amount of unprotected but hugely important media content out there on hard drives (music, movies, home movies, pictures), is growing every day. People need somewhere to back this data up for a reasonable fee, and it seems to me that Dell and others should package this service with the PC. All initial software would be auto stored, and users would have the option to continuously syncronize their hard drive with the virtual drive. And while this business has thin margins, this is a multi-billion dollar per year revenue opportunity. The information above simply highlights the much more detailed information in the table linked to the left. We were not able to speak to every company directly and the information available on websites is usually incomplete or hard to find. Therefore, we’ll be updating this table as more and better data comes in. Also, I’m sure I’ve left out any number of competitors in this space, so I will be updating the list of companies as well. 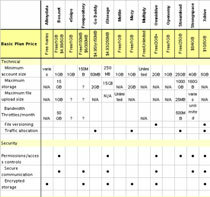 For the full feature comparison table, see here. Research for this post was conducted by Adam Bouskila, a 17 year old genius who lives in Vancouver, Canada. I cannot thank Adam enough for his hard work, and I hope to work with him again on future posts. Update: It’s clear to me from comments and emails that this space is exploding, and that I missed a lot of companies and features. I also hadn’t realized Fred Wilson posted on this subject last December, but he has an excellent post here.